A quick and easy meal or snack, these wings are baked (not fried!). Look for chicken wings that are already split and have the wing-tip removed to make this dish even easier. To make the Sriracha cream: Whisk together the mayonnaise and Sriracha. Season with a generous amount of freshly ground pepper. Taste and add more Sriracha, to taste. To make the Teriyaki Sauce: In a small saucepan over medium heat, add soy sauce, brown sugar, ginger, garlic powder, honey and water. Bring to a simmer. Mix cornstarch with 1 Tbsp. water and stir in to sauce. Allow to simmer until sauce thickens slightly, about 2 minutes. Remove from heat and allow to cool at room temperature while you prepare/bake wings. 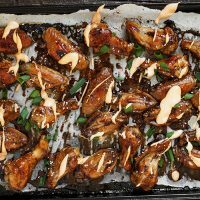 For the wings: Line a baking sheet with parchment paper and pre-heat oven to 400° Spread wings on parchment and bake in pre-heated oven for 20 minutes. Remove from oven and transfer wings to a large bowl. (I like to discard parchment and any accumulated fat/juice and replace with a fresh piece of parchment). Add teriyaki sauce to wings in bowl and toss well to coat. Place wings back on to baking sheet and pour any additional sauce over top. Return wings to oven and bake for an additional 10 minutes. Remove from oven and flip wings. Cook an additional 5-10 minutes, or until wings are cooked through. If desired, flip wings once more, switch oven to broil for a few minutes and brown up the tops of the wings. Serve garnished with sesame seeds, green onions and drizzle with Sriracha Cream.